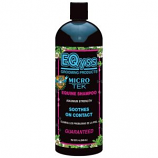 EQyss Grooming Products are the only products on the market that do not contain ingredients that coat or damage the hair. • Safe for horses, ponies and foals. Eqyss Grooming Products - Survivor Super Detangler Shine For Horses - 8 oz. • Use After Bathing For A Silky All Over Ap-Plication Or N Dry Hair To Enhance Shine In Between Grooming. • Safe To Use For Dogs, Cats and Puppies.